Home Google Nexus 6 Nexus 6: Here it comes. Nexus 6: Here it comes. Wohooo Google announced today the latest flagship smartphone Nexus 6 along with its latest Android Lolipop. Its a whopping upgrade with not just a very cool newer Android version but the hardware specification are best in the industry as well. 1. A really big 5.95 inch screen. 2. A battery which can last 24 hours which supports turbo charging. 3. 3 GB of RAM yes that's correct. 6. 32 GB internal storage starting. It has the latest Android 5.0 Lolipop. It promises to be a mega software upgrade from its predecessor Android KitKat. The update will be available to Nexus 5, 7 and 10 devices. Its another shocker that it will not be available on Nexus 4. This is one of the biggest surprises. Google has moved away from the affordable category of $349 to $649. This is one of the biggest shocks. Google has directly entered the premium phone category and will directly compete with the likes of iPhone 6, Samsung Galaxy S5 and more. Many Nexus fans will be very disappointed by such a huge bump in price. Nexus 6 will be available for pre order from 29th October 2014 in the US. 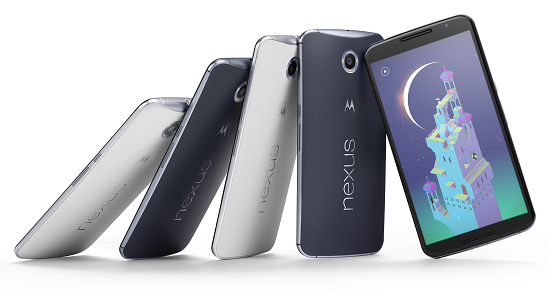 All major US carriers such as AT&T, T Mobile, Sprint and US cellular will sell Nexus 6 in US. Check out the video preview. This is one of the biggest smartphone launches by Google in recent times. Apart from huge price rise there is nothing in this phone which is disappointing.